Click on Generate, view, upload, or delete your private keys. The private key will be saved in cPanel so there is no need to copy it. Click Return to SSL Manager. 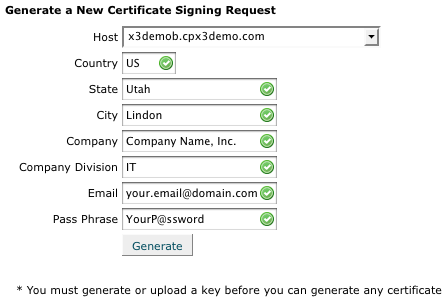 Click on Generate, view, or delete SSL certificate signing requests. Host - The domain that you entered or selected when generating the private key. State - The state in which your organization is located. Do not use an abbreviation. City - The city in which your organization is located. Company - The legally registered name of your organization/company. Company Division - The name of your department within the organization (frequently this entry will be listed as "IT," "Web Security," or is simply left blank). Email - Your email address where the CSR will be sent. Pass Phrase - Make up a password to be associated with the certificate. You will need to remember this password later. Click the Generate button. The CSR will display in the window. Copy and paste the entire CSR (including the BEGIN and END lines) and paste it in the space provider by your SSL provider. 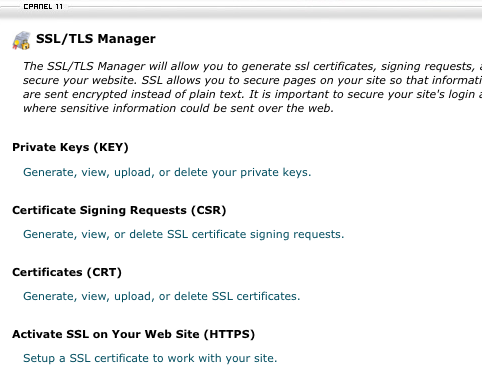 After you receive your SSL Certificate from your SSL provider, you can install it.